Having a calling to teach is something Sumter Academy teacher Kristin Williamson is passionate about. "Often in our profession, teachers that are called do not teach, and some that aren’t called, teach," Williamson said. "I think it is important to know when you step foot in those classrooms, somebody’s mama is sending you their very best. It’s important for those kids to know they are loved, and that's something I am very passionate about. That’s my advice for anyone who teaches." 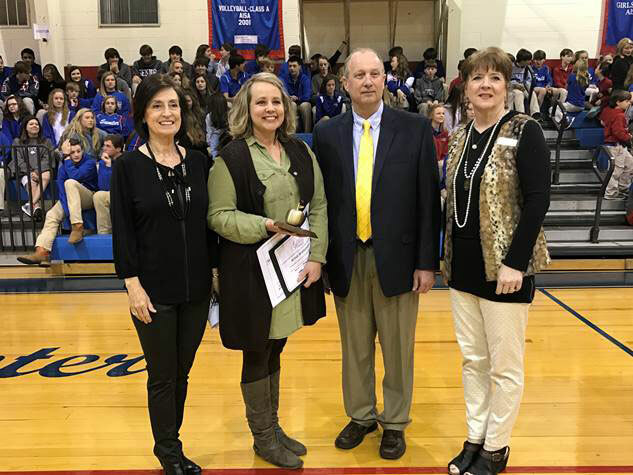 For her dedication to her students, Williamson, who teaches math and science, was named the Golden Apple Teacher of February. The honor means a lot for the school, said Headmaster Glen Sanders. 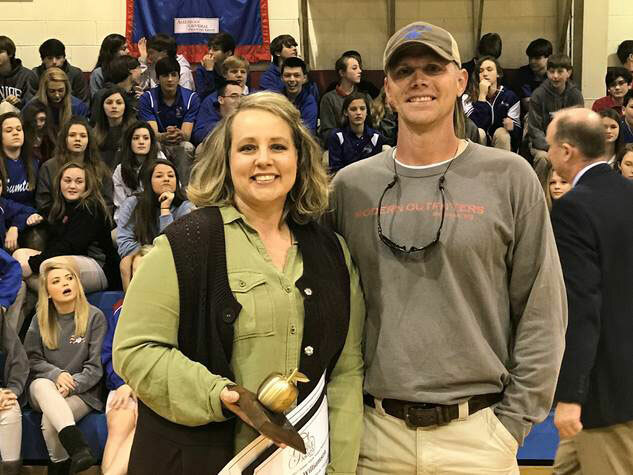 "We have very good teachers at Sumter Academy and to have one of our teachers honored as the Golden Apple recipient is a big deal for us," Sanders said. "This is her first year to teach here, and she brings a great attitude with her each and every day. She has a desire to have her kids learn and she does whatever is necessary to make that happen. She does an outstanding job, goes above and beyond, and steps outside the box with all she does." Williamson graduated from Southeast Lauderdale in 1995, then attended college at the University of West Alabama and Mississippi State University. She's currently pursuing a degree in library media at UWA. "I was fortunate enough to attend Southeast Lauderdale, a school that had some of the best teachers in every single subject – Virginia Etheridge, Debbie Coker, Celia Hall and David Little," Williamson said. "It is no secret that when we went to college we were prepared. Those are the teachers that molded and shaped me, and I wanted to be more like them." 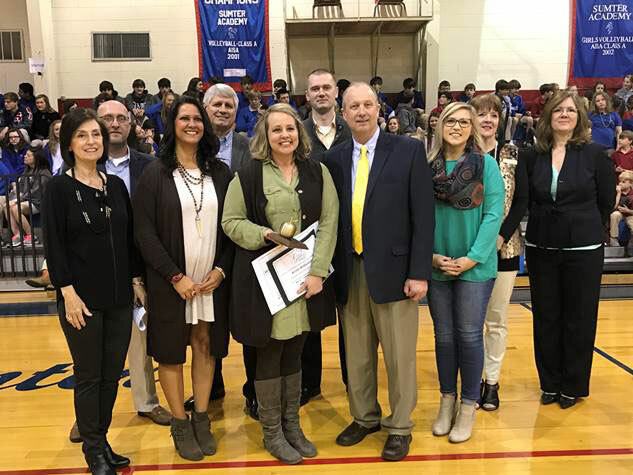 Williamson, who has been in the education field for 10 years, said she never considered herself a Golden Apple teacher – believing others are more deserving. "Honestly when I heard my name called I was just thinking of all the teachers here who I can see so deserving of this award," Williamson said. "Also, my students – Each day I get up and try to be the best for all my kids, but I fail often. I feel so humbled, overwhelmed and undeserving of this award. If I could give it to all 29 of my kids I would because they are the ones who deserve the award." A teacher wears many hats, Williamson said. "Sometimes we are their mom and dad," she said. "I think it is important for kids to know they are capable of learning and to not settle for anything. Just keep pushing them, don’t slack up, and don’t enable them. I think you also have to be tough on them, and let them know it’s important to get an education. Education is something that can’t be taken away." Williamson’s favorite thing about being a teacher – smiling faces. "I think a teacher's greatest thrill is to see those 'a-ha' moments when you teach a concept and only yesterday they didn’t have a clue," she said. "When you see those smiling faces you know then you have taught them something." Students Connor Larkin and Jordan Jones say Williamson is a big help in the classroom. "I usually have questions on just about everything, and she helps me to get it right," Larkin said. "She makes teaching fun, and has a great way of explaining things, especially math which I get confused in," Jones said. When she is not teaching, Williamson enjoys reading, watching her children Cody and Ragan play sports, and spending time with her family. Her husband, Geoffrey, said he was proud she received the award. "She puts a lot of hard work into what she does, and is involved with everything," he said. "I have to get on to her sometimes because she doesn’t like to say no to people. She likes to help everybody."